Two books on interfaith marriage made something of a splash in 2013: both are poised on the line between scholarly and popular literature, and both are written by experienced journalists whose own marriages are interfaith. That is where the similarities between the books end, but because they represent opposing viewpoints, and they and their subjects are oriented towards different kinds of religious communities, we can gain insight into debates about interfaith family life. What is at stake in both texts are their intersecting, yet often conflicting, assumptions: about community, about identity, and about the malleability—or rigidity—of individual religious practice in an increasingly diverse American landscape. The pain evident in the interviews from which Schaeffer Riley draws her statistics is striking. She suggests that religious difference generates constant tension, not about theological divisions, but about life. To what (if any) community should we belong and invest our time and money? What rituals and education do we want for our children? She explores the moments when interfaith marriage results in loneliness, bitterness, and pain, often using examples of times when interfaith marriage means that a parent cannot share in a child’s life cycle event—for example the exclusion of a Christian parent from a child’s bar mitzvah. Schaeffer Riley describes unhappiness and conflict within interfaith marriage as almost inevitable, even for couples that compromise well and love each other dearly. In her view, religious difference creates constant strain for both interfaith couples and religious communities, taxing religious continuity and stable home life. 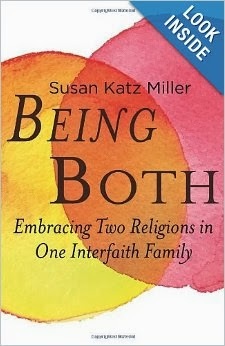 Susan Katz Miller takes a very different approach in her book, Being Both: Embracing Two Religions in One Interfaith Family, published by Beacon Press. Katz Miller does not make the same statistical claims about happiness within and reasons for interfaith marriage. Rather, Katz Miller’s book explores the choice to raise children and create communities comprising more than one religion. She does not ask whether interfaith marriage is good for organized religion or marriage. Instead, she explores what can make a family that “does both” successful. Katz Miller, herself the child of a Christian–Jewish interfaith marriage, was raised as a Jew despite the fact that, when she was growing up, the Reform movement did not formally recognize patrilineal descent; as an adult, she married an Episcopalian. Together, they decided to raise their children in an explicitly interfaith community, Washington, DC’s Interfaith Families Project. Having now experienced both an interfaith family choosing one religion and an interfaith family choosing both religions, Katz Miller argues that there are pros and cons to each choice. Similarly, she points out that there are pros and cons to choosing a third tradition or to avoiding religion altogether. Having established her position that no one path is perfect for interfaith families, Katz Miller sets out to demonstrate how families that chose both religions can operate happily. Katz Miller mixes memoir with interviews with interfaith couples, clergy, and young adults raised in interfaith homes, focusing on her own DC group as well as communities in the greater New York area and in Chicago. She notes that two major concerns about the “doing both” option are that families will lack a like-minded community and that to truly raise children to be conversant with both traditions will take an impossible amount of work. Katz Miller acknowledges that being attentive to two faiths in a family’s life does involve a lot of work, but she demonstrates that the families who do so believe it is worth the effort. An interfaith community will support this effort, making “doing both” a more viable religious option. She addresses charges that these children will not acquire the same depth of knowledge in either tradition as children who are taught about only one religious tradition. She points out that this is to some degree inevitable, but that a solid grounding in both of the traditions in their heritage is as good, if not better, than full immersion in one tradition and the exclusion of the other. She asserts that such an upbringing provides skills in interfaith engagement, teaches flexibility and understanding of views different than one’s own, and nurtures an ability to translate between worldviews and to engage with complexities absent from the single-faith tradition. She explains that being part of an interfaith community means that someone who is a member of an interfaith family does not have to live on the margins of religious community. Katz Miller’s vision is in many ways attractive in its complexity. We need to recognize, however, the benefits of the dual faith education are different than the attributes that Schaeffer Riley emphasizes as valuable in the single religion home. Perhaps the most important contribution of Katz Miller’s work is her collection of interviews with people raised in interfaith homes. She argues that these young people are not confused about religion and identity, at least not more confused than anyone else in that age bracket. She points out that these young adults are satisfied with their upbringing: they either go on to chose one of the religions from their upbringing, or to stay in an interfaith context, or to chose a third religion. In this, she suggests that they are not different than their peers whose families espouse one religion. From their inception, these projects have had different agendas. Schaefer Riley frames intermarriage as a problem—one that is harmful to religious communities and likely also bad for the institution of marriage itself, for the couples in the marriages, and for the families they create. 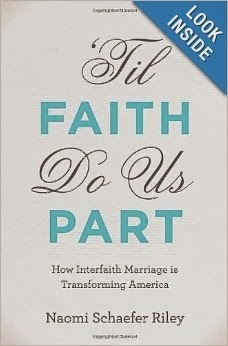 Susan Katz Miller, on the other hand, assumes interfaith marriage is a fact of modern life, with its own positive qualities, and her manual/memoir comprises a collection of suggestions and examples showing how to make interfaith marriage succeed. These differences reflect the author’s individual experiences, but they are also the result of their methods and the communities on which they focus. Schaeffer Riley uses broad sociological studies to point to overarching trends, but her survey material does not explore precisely in what ways interfaith marriages are less happy—and her interviews, which point to mismatched expectations, do not address the findings of other scholars, including myself, Jennifer A. Thompson, and Keren McGinity, who have found that religious differences are usually not cited as the primary reason for interfaith couples to split up, though they may certainly exacerbate other tensions in an unhappy marriage. Rather than focus on broad trends, Susan Katz Miller offers detailed examples of how couples have made it work to “do both.” In Katz Miller’s terms, doing both “works” if it seems a good fit for the family involved—she is less concerned with the needs of religious institutions than is Schaefer Riley. Comparing the concerns of the two authors, side by side, point to the battle lines in the debate over interfaith marriage: Schaefer Riley is primarily concerned with stability, for couples and marriages, but also for religious institutions. She focuses on the problems couples face in their interfaith marriages and the conflicts that divide them, rather than on the aspects of the marriage and family that are strong. In doing so, she replicates the dominant trend in sociological studies of intermarriage, pathologizing and emphasizing its difficulties, but doing little to illuminate the way that people in the marriages understand their own religious experiences, interfaith or otherwise. Her approach is affiliation focused—what does it mean for individuals and institutions, for interfaith families to exist outside, or on the margins, of religious institutions. Susan Katz Miller has a much more individualized approach to religious life, for all her work focuses on the value of interfaith community. Individuals, rather than clergy, serve to structure religious traditions. Religious meaning and truth is a quest for the individual, even if that individual is in community. In these ways, Katz Miller is correct when she points to her path as growing—Pew studies tell us much about the rise, both of the “nones” and of the mixing of religious practices. Scholars have long known that institutional affiliation is on the decline. Success, in Katz Miller’s model, is not the child affiliating with the tradition selected by its parents, or with a tradition at all: it is the child with the self-confidence and comfort to go forth and find his or her own truth. Katz Miller may well be articulating an increasingly popular path. These different understandings of success lead to opposing assessments of intermarriage and also map the poles of the debate on what interfaith marriage might mean in America.